At first sight, raw cauliflower doesn’t instill much love. It’s often the boring white vegetable on the crudité platter. But once it became the new paleo rice, mashed potatoes and pizza crust, cauliflower was 2017’s it vegetable. I still prefer it cut into “steaks” and grilled or roasted, which not only makes it pretty (yes, pretty), but also so much more delicious. 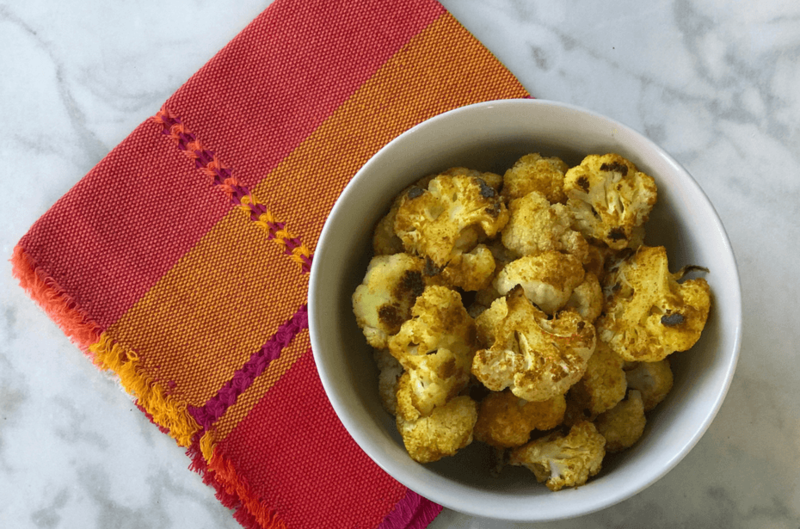 One of my favorite so-easy and so-good prep methods is to simply toss cauliflower florets with a little olive oil and a turmeric based spice blend. Here, I combine it with a little cumin, garlic powder and salt, too and while my fingernails are still turmeric-yellow, this a simple weeknight recipe that everyone loves. 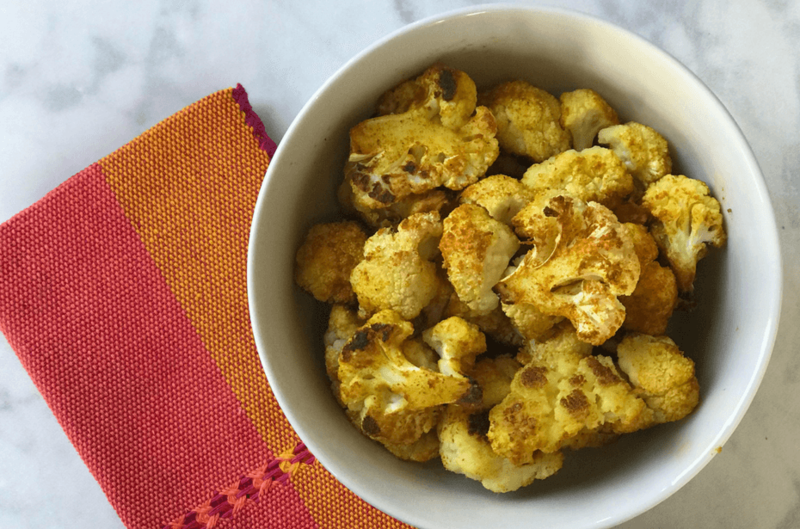 Rich in fiber and potassium, and packed with vitamin C, cauliflower has always been “it” nutritionally, and given a little love, it can be well, lovely. This is one of those veggies that kids will enjoy prepping and eating if you approach it diplomatically – tell them to help color some veggie flowers or make veggie popcorn. I used to tell my son the florets were broccoli’s cousins coming to visit. He still loves cauliflower today. Hope you do, too! Make a spice blend by mixing the spices together in a small bowl. 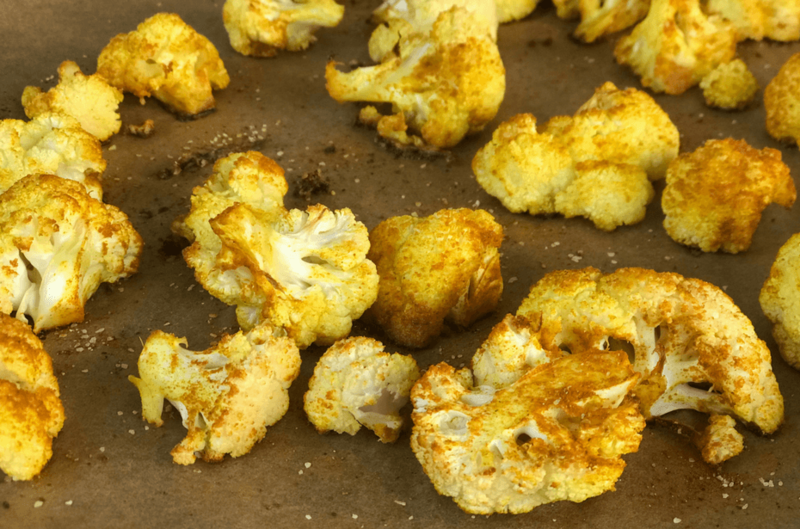 Sprinkle onto the cauliflower and toss until the cauliflower are well coated (you may not use all of the spice blend). Roast for 15-20 minutes, until cauliflower are firm-tender and begin to brown at the edges. Spicy black bean soup for a great meatless meal. These flavors actually get better with time. Make head and use in warm or cold grain or green salads or as one your Sunday meal prep ingredients.